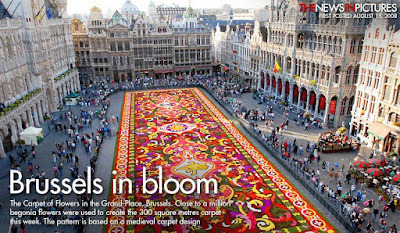 I recently came upon these fantastic photographs of Brussels' live Flower Carpet, which they set up in the main square called the Grand Place. 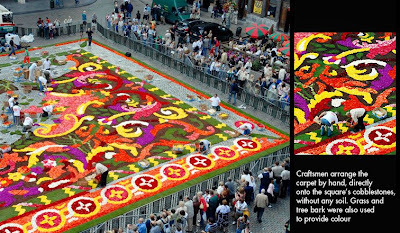 One million begonias are placed directly on the cobblestones of the main square mimicking a medieval carpet design called Savonnerie. Grass and bark are used to fill in for the brown and green, dahlias for the blue. 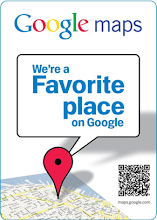 The total size is an incredible 3200 square feet and is only on display for 4 days! At night, a light and sound show is staged, creating a magical evening, especially if you are fortunate enough to view it from the balcony of City Hall. There was no Flower Carpet there that evening, but it was still the experience of a lifetime! Last month, I saw North Carolina's own little version of the Flower Carpet, at Biltmore Estate in Asheville, much smaller in scale but certainly still impressive. We arrived to a light rain, with the soft light making the flowers just jump out at us! Congratulations to Erin Boyle, the October winner of a Bloomers' Gift Certificate! The Horses! The Flowers! The Hats!